FREE APPRAISAL. To appraise, auction, buy, consign or sell your Henry Stanley autograph that is for sale, please email Nate@NateDSanders.com or contact Nate D. Sanders at (310) 440-2982. We will also grant you a high reserve which no other auction house will let you do. Auction your Henry Stanley autograph that is for sale. Contact nate@natedsanders.com to sell your Henry Stanley autograph. 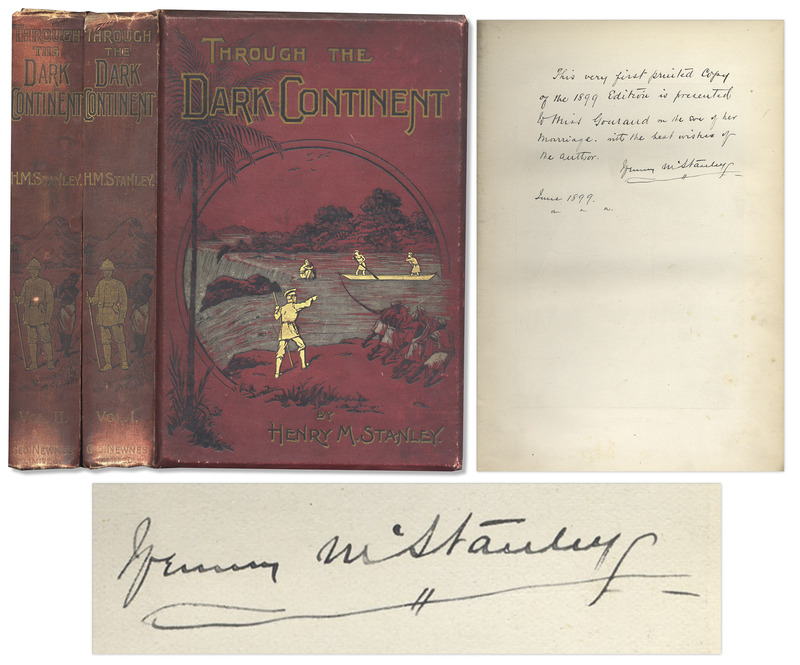 Henry M. Stanley signed copy of “Through the Dark Continent”, published by George Newnes, Ltd.: London: 1899. In two volumes, volume I is neatly inscribed by the celebrated explorer/author: “This very first printed copy of the 1899 edition is presented to Miss Gourand on the eve of her marriage. With the best wishes of the author. Henry M. Stanley. June 1899”. Stanley, who purportedly uttered the memorable line “Dr. Livingstone, I presume?” upon discovering the Scottish missionary, led many expeditions through Africa. This memoir covers two of his more famous ones: the 1874-1877 journey from the mouth of the Congo River to Zanzibar and the ill-fated Emin Pasha Relief Expedition of 1886-1890. Books have pictorial red cloth and gilt boards depicting the scene of an historic river rescue and are full of illustrations, engravings and maps, including one fold-out map. Each book is tightly bound and measures 7″ x 9.75″; Volume I runs 400pp. and Volume II runs 419pp. Restored pastedowns and endpapers, some tearing at joints and expected shelf wear. Very good condition. Sold for $1,542. Consign your Henry Stanley autograph that is for sale. Contact nate@natedsanders.com to sell your Henry Stanley autograph. NO OBLIGATION, FREE ESTIMATE. To appraise, auction, buy, consign or sell your Henry Stanley autograph that is for sale, please email Nate@NateDSanders.com or contact Nate D. Sanders at (310) 440-2982. We will also grant you a high reserve which no other auction house will let you do.